So I’m going on 7 years old this Summer and I’ve started to play like a kitten again. Mommy and daddy are so excited that I’m “into” playing again. I don’t like bought toys or conventional things. I prefer to chase a piece of string that they have tied to a plastic rod and it has a ton of knots in it. I LOVE LOVE to chew on knots! I know I’m so silly! I am the weirdest cat in that I don’t like wet food. Most cats run when they smell the moist, wet food come out. Mommy tries every now and again, to get me to eat the wet food. So once in awhile I devour a little few bites of “Natural Balance Salmon and green pea limited ingredient” wet cat food. But mostly I just like a dry food mixture of the “Natural Balance limited ingredient, Salmon and green pea and Chicken and green pea” dry food. Sometimes I do like to sniff around when Mommy is making Tuna salad sandwiches. She gives me just a couple of “pinches” of the tuna and I really do love that. But even then, I walk away after a pinch or two! I must say that I am such a good girl! I’m so pretty and sleek and actually pretty gorgeous! But I’m not conceited at all! I think that I’m the most precious, smartest and best behaved kitty ever! But again, I’m not conceited at all. I think My mommy is going to post a video tape of me playing with my string knots that I love to chew and gnaw on. The weirdest thing, or another odd thing about me, is that I don’t like conventional toys either! MOL….I like the ones daddy makes for me but I don’t like or prefer “store bought” toys. For Halloween, Mommy got me some “kitty YODA ears” to wear. I was NOT having any of that. I am a CAT and I will not be lowered to wear any kind of “ears” other than my own! Besides, it’s my mommy and daddy’s job to please me, in life….right? In the long run, by them pleasing me…..It makes them happy, so I let them please me pretty much whenever they want…MOL…. Have a great day everyone and come back to my Kitty Cat Diaries again…see what I’m up to! 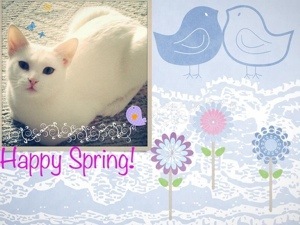 Sending lots of headbutts, purrs and Kitty LOVE! Previous Cat Scouts and Happy New Year! Next Dear Diary, It’s All Up To Me! I really like the “meow out loud” phrase. How funny! I am glad you are doing so well with your folks.